“Fentanyl is manufactured death,” said the special agent in charge of the New England field division of the US Drug Enforcement Administration. LAWRENCE — Mexican cartels are delivering vast quantities of the inexpensive and powerful synthetic drug fentanyl to New England, causing the highest rate of fentanyl-related deaths in the nation while creating a plague that the area’s top drug enforcement official describes as “like no other epidemic” he’s ever seen. It’s a pipeline that often begins in China, winds through Mexico, and flows into distribution cities such as Lawrence and Springfield, according to Michael J. Ferguson, the special agent in charge of the New England field division of the Drug Enforcement Administration. There, it’s packaged and shipped off to other urban centers and remote hamlets. In a candid and often alarming 90-minute interview, Ferguson offered a detailed look at how fentanyl arrives in the region and an unsparing perspective on the way the drug has destroyed families and threatened entire communities. The Sinaloa and Jalisco New Generation cartels are chiefly responsible for the region’s fentanyl trade, said Ferguson. They typically procure fentanyl or its chemical components from China, process it in Mexico into powder and pills, and ship the synthetic product to local distributors. The result is menacing — a metastasizing foreign-organized drug trade that is fueling a deadly crisis of addiction and stretching law enforcement to its limits. The opioid epidemic has ravaged nearly every part of the country, but New England has been especially hard-hit by the pervasiveness of fentanyl, a drug about 40 times more powerful than heroin. New Hampshire and Massachusetts rank first and second in per-capita deaths caused by fentanyl, which has surpassed heroin as the leading cause of fatal opioid overdoses in those states. A seemingly endless black-market supply that brings fentanyl to the smallest, most remote towns, sometimes at a street-level cost of only a few dollars, has deepened the crisis, even though the drug rarely originates in the United States, Ferguson said. Often, the opioid is mixed with heroin. 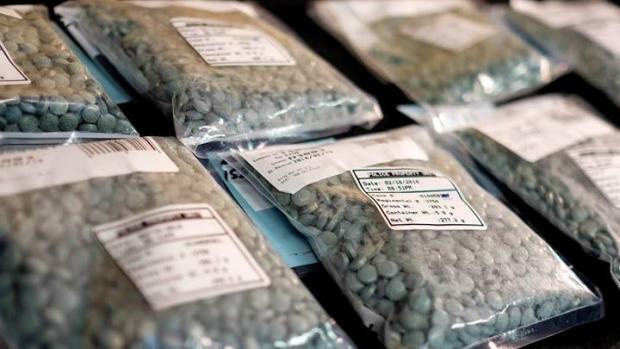 Illicitly produced fentanyl also is obtained over the “dark web,” a shadowy Internet market where the drug can be bought cheaply from Chinese and other sources. Sometimes, the opioid arrives undetected through the Postal Service. But about 80 percent of the fentanyl that reaches New England comes from Mexico, usually smuggled in vehicles across the vast Southwest border, Ferguson said. From there, fentanyl hidden in secret compartments — sometimes in 18-wheelers carrying fruit and vegetables — are often driven straight to a city such as Lawrence, where the confluence of interstates 495, 93, and 95 means fentanyl can be handed off quickly after a short detour from the highway. Although cartels provide the infrastructure to dominate the market, the distribution of fentanyl in Lawrence and other New England cities generally falls to local drug traffickers and middlemen, who often adulterate the fentanyl with additives or other opioids to stretch their supply, Ferguson said. In Lawrence, a major gateway for the fentanyl that reaches New Hampshire and Maine, distribution is handled primarily by Dominicans — many in the country illegally — who have established a working relationship with the cartels, Ferguson said. Lawrence police Chief James X. Fitzpatrick, who corroborated Ferguson’s description of the business model, estimated that hundreds of people living in Lawrence, a city of 76,000, are active in the drug trade. Much of the supply is sent north to New Hampshire and Maine. But local demand is strong, too, and sometimes fatal. On July 17, Fitzpatrick responded to a pair of overdose deaths involving fentanyl — the first multiple deaths by opioids in one incident he could recall. A third overdose victim survived and told emergency workers that he suspected the drug was carfentanil, another synthetic opioid that is 100 times more powerful than fentanyl and is designed to be an elephant tranquilizer. Lab tests showed that the drug was fentanyl mixed with cocaine, but Fitzpatrick was prepared to hear that carfentanil — the latest in a series of powerful drugs that has fueled the opioid epidemic — had found its way to Lawrence. “It’s not getting better," Fitzpatrick said a few hours after the fatal overdoses. A major reason is that fentanyl, originally designed to curb pain in cancer patients, has largely supplanted heroin in many parts of New England as the opioid of choice. Unlike heroin, which is derived from the opium poppy, fentanyl does not have the overhead costs associated with cultivation, and it is far more potent. Even a dose the size of two grains of salt can be fatal, Ferguson said. Since last July, the DEA has seized approximately 99 pounds of fentanyl in New England and 73 pounds of heroin laced with fentanyl, according to Special Agent Tim Desmond. The drug not only provides the lure of a more powerful high, but also the prospect of quick, large profits. A kilogram of fentanyl, bought for $5,000 in China and sold for $55,000 in New England, can return more than $500,000 after additives such as talcum powder, lactose, and caffeine are used to produce up to seven kilograms of an adulterated opioid. On the street, fentanyl can fetch from $300 to $400 for a 10-gram “finger,” or $50 to $75 for a gram and $25 for a half-gram, DEA officials said. If fentanyl is turned into counterfeit opioid pills, profits become even more lucrative. One kilogram of fentanyl can produce up to 500,000 pills, which can be sold for $10 to $20 each. As a result, an initial $5,000 investment could yield up to $10 million. “If you’re buying prescription pain pills on the street, odds are they’re counterfeit,” Ferguson said. Last year, opioids were linked to 2,069 deaths in Massachusetts, a 15 percent increase from the year before. Fentanyl was found in 69 percent of those deaths in which a toxicology screen was available. In New Hampshire, 70 percent of opioid-related deaths last year were linked to fentanyl. Researchers at the Geisel School of Medicine at Dartmouth College released a study in June that pointed to Lawrence as a major gateway for the fentanyl ravaging New Hampshire. More than 50 percent of opioid users interviewed for the study pointed to the city as the source of their drugs, which can be easily obtained after a short drive along Interstate 93. The distribution network often resembles a family business, law enforcement officials said. Many of the middle-men and dealers are related, while others are recruited by acquaintances. Much of the profit is sent back to the Dominican Republic or other foreign countries, where the money often is used to buy beachfront villas and hillside estates, Ferguson said. Once the fentanyl reaches New England, the opioid is generally mixed in apartments, homes, or other “stash houses” that distributors sometimes rent for a couple of months or procure by supplying an addict with free drugs, according to users who spoke with the Dartmouth researchers. The mixing process is not sophisticated chemistry, Ferguson said. Often, it’s simply done in blenders, which sometimes are whirring away when DEA agents break down doors during drug raids. Frantic attempts to destroy or discard the evidence often leave agents with a dangerous mess to clean, according to a DEA agent who raids clandestine labs. The scene becomes a hazardous-waste site that requires extraordinary protection for agents, who know that even casual contact with fentanyl can be lethal. After the recent overdoses in Lawrence, for example, a specially trained crew needed at least six hours to clean the apartment. The alarming surge in fentanyl-related overdoses hit New England about three years ago, when the drug began appearing in what many users and dealers believed to be heroin. Now, many users know that fentanyl is in their supply, and they are more aware of its dangers, but the drug still attracts users in search of an extreme high that brings them to the brink of death. Fentanyl is shorter-acting than heroin and its withdrawal pains usually arrive sooner, which means many users are driven to buy fentanyl at a faster pace than heroin. Ferguson said he believes the epidemic will get worse before it gets better. But in Massachusetts, the rise in opioid-related deaths has begun to slow, from a 40 percent increase in 2014 to 16 percent last year. China has begun to crack down on illicit fentanyl production, and law enforcement here is making progress in stemming the flow of drugs, Ferguson said. The DEA has task forces at 16 offices throughout New England that combine federal agents with State Police and local officers who join for a minimum of two years. The DEA also has opened a third office in China and maintains a presence in Mexico and the Dominican Republic that allows for immediate sharing of intelligence gleaned in New England and elsewhere, Ferguson said.